Girl before a Mirror. Boisgeloup, March 1932. 64 x 51".Gift of Mrs. Simon Guggenheim.Pablo Picasso Girl Before a Mirror shows Picasso's young mistress Marie-Therese Walter, one of his favorite subjects in the early 1930s. Her white-haloed profile, rendered in a smooth lavender pink, appears serene. But it merges with a more roughly painted, frontal view of her face—a crescent, like the moon, yet intensely yellow, like the sun, and "made up" with a gilding of rouge, lipstick, and green eye-shadow. Perhaps the painting suggests both Walter's day-self and her night-self, both her tranquillity and her vitality, but also the transition from an innocent girl to a worldly woman aware of her own sexuality.It is also a complex variant on the traditional Vanity—the image of a woman confronting her mortality in a mirror, which reflects her as a death's head. On the right, the mirror reflection suggests a supernatural x-ray of the girl's soul, her future, her fate. Her face is darkened, her eyes are round and hollow, and her intensely feminine body is twisted and contorted. She seems older and more anxious. The girl reaches out to the reflection, as if trying to unite her different "selves." The diamond-patterned wallpaper recalls the costume of the Harlequin, the comic character from the commedia dell'arte with whom Picasso often identified himself here a silent witness to the girl's psychic and physical transformations.Here you can own a best reproduction of Pablo Picasso Girl Before a Mirror Painting .100% handmade Girl Before a Mirror!! Beautiful, original hand-painted artwork in your home. Interpreted paintings based on the masters' works of Pablo Picasso.This Girl Before a Mirror needs about 14 - 16days for production by a talented artist. 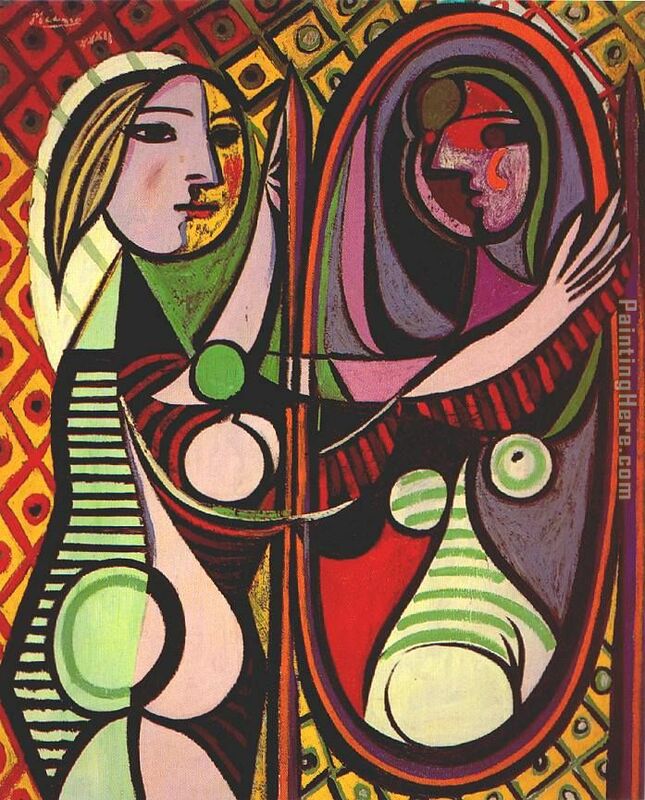 If you're not happy with Pablo Picasso Girl Before a Mirror that you made on PaintingHere.com, for any reason, you can return it to us within 50 days of the order date. As soon as it arrives, we'll issue a full refund for the entire purchase price. Please note - PaintingHere.com does not reimburse the outgoing or return shipping charges unless the return is due to a defect in quality. If you want to purchase museum quality Girl Before a Mirror at discount price, why not give us a try? You will save a lot more! This Pablo Picasso Girl Before a Mirror needs 14 -18 days for production time frame. We ship all over the world. We can provide Girl Before a Mirror Painting stretched canvas and large framed art.